My friend asked me for help with an IQ test and after she did it online she came back at me with the ones she couldn't solve. Two of them however, I discovered are the same puzzle type, but no matter how much I look at it, I just can't see the logic in it. We redid the test and this puzzle occurred yet again, so now I have three versions of the same type of sequence written below. 19 43 83 233 59 61 283 ? 11 35 75 225 51 53 275 ? 5 29 69 219 45 47 269 ? I get the feeling that this puzzle is easy, yet I just can't see it. By request, I give the five options for the answer of the top row that I wrote down during the second test. The options are: 800 778 793 58 176. I'm actually leaning towards Jonathan Allan's explanation of a mistake in some data entry for their automated question generation right now, since no one here seems to have solved it yet. Prior to my post here, my friend emailed them asking them about this sequence, so most likely we will know between now and a few days. Looking at the options again, this puzzle is really really simple. Thank you smriti. 793: Why? They are all odd numbers! (Only possible to guess given the multiple choice nature of the question) The pattern means diddle squat. Another pattern exists in the second digit... but this might be seeing patterns where there aren't any. It might also be giving even more credibility to the modulo + offset theory. (base+offset)%10 works for the patterns below. 24 40 150 -174 2 222 ? So as these three sequences share the same changing sequence then the changing isn't related to the numbers themselves but the differences between the numbers. Because in the next equation: The first in the equation is the number that is three positions further in the sequence. The second number increases with ten. The difference between the first in the equations place in the sequence and the sums number in the sequence increases by one less for each equation. 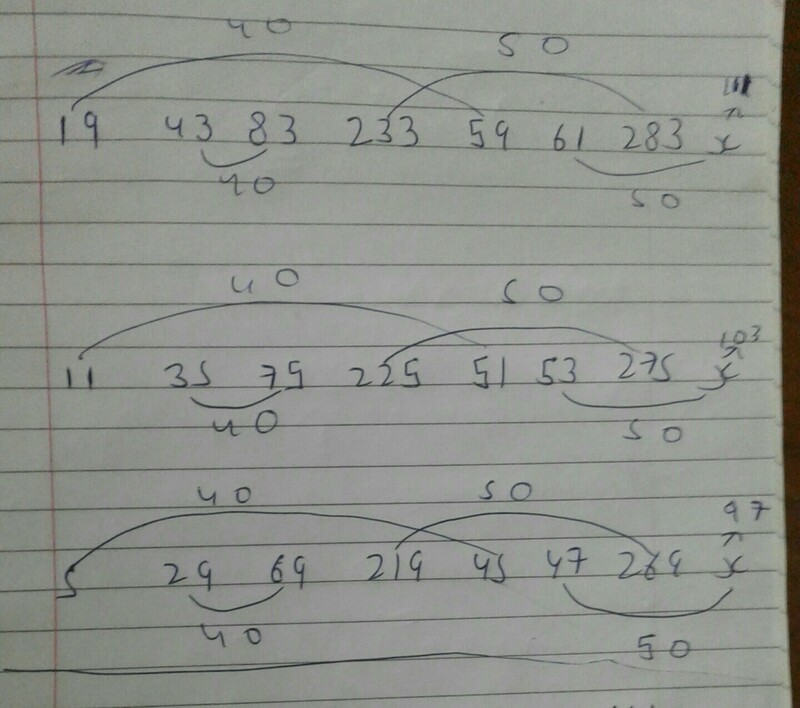 Therefore for the last number in the row for the first sequence would be 283+60=343. This would mean the there are some decoy numbers and we have only deduced the pattern from two cases which makes me doubt that this is the right answer. I added numbers after the slash based off the bottom. Every number has a 4 in it, with many 2's and 6's. Work in progress for others to consider. Is there a pattern to the numbers now? Multiplying the 2 digit pairs and brings you products unusually close to each other(<100 in each case), but I didn't get any further than that. Also Not sure how it helps, but those sequences are each unfairly weighted to a single digit, in the same positions. I think numbers should be 111,103,97 respectively. We take difference only those number whose last digit is same. Coincidence...? but this is not working for the 2 other sequences. The pattern is simply odd numbers. Of the choices, only one of them is an odd number.